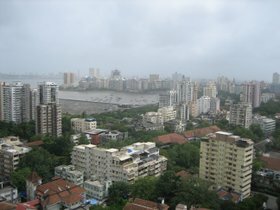 180 degree view of Mumbai from my new home in Colaba. On the left I can see Nariman Point facing Cuffe Parade, in the middle is Mumbai's cityscape growing north and on the right is a view of the Arabian Sea. Writing this blog is a therape utic experience for me, especially when I feel frustrated with the challenges of setting up a new life here. It allows me to take a step back from my life and examine it objectively. I was reading some of my previous entries here and I could sense my own transition from an outsider to a local in the last few months. As I spend more time here, the thrill of being back home in India has begun to fade away. The mundane aspects of daily domestic life in India are coming to the fore now. When I lived in NYC, my speed dial list was always reserved for hotties. Now, they have been replaced by mission-critical contacts like the electrician, plumber, cable guy, A/C repair guy, washerman, v egetable delivery guy, grocery delivery guy, maid, watchman.. the list is exhaustive. How my life has changed! Anything can go wrong anytime. I am beginning to believe that every device in my house has a temperament of it's own. Yesterday, I was a bit hungover and forgot to wish my shower head a very good morning before I turned it on. Like a woman scorned, it got upset and taught me a lesson by turning off the water just when I had soap all over my eyes. Sheesh, that's a low down trick if you ask me! Afer a couple more such inexplicable 'accidents' in my new house, I have become rather wary of the devices I live with. Today morning, I took the extra precaution of politely requesting my tea kettle if I could put it's bottom on fire to make my tea. It didn't seem to mind and made me a an excellent cuppa to start the day. I think I am getting the hang of living in Mumbai now. But I am getting ahead of myself. Let me first tell you how I found my new home. Just then, my broker called me and informed that he had found the perfect place for me if I was willing to risk the flooded streets and get to South Mumbai in the next couple of hours. There was another verbal offer on it but I could get the apartment if I got there first with my check book. The landlady was from Delhi and wanted to close the deal in the next few hours and return home. Meanwhile, the newsreader on TV was advising everyone to stay at home as the weather was getting worse. I looked outside my hotel window. It was raining cats and dogs. 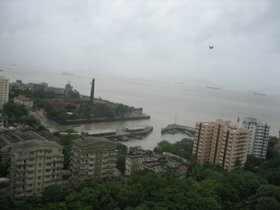 One more week of rain like this we could shoot 'Waterworld II' right here in Mumbai. I paused for a second and then I headed out. I knew an enterprising cabbie who had been driving me around and called him on him to help me out. He agreed and we drove through 12 kilometers of knee-deep water to get to Colaba. I was amazed how the car got through all that water without stalling. It was well worth it. The apartment met all my stated requirements and came at the upper range of my budget along with some conditions that are peculiar to Mumbai (11 months advance rent and three months deposit). I really liked the place and closed the deal after some negotiation. (In India, no deal can be closed without some negotiation. It’s almost mandatory to haggle a bit, as a sign of your seriousness in the deal.) Suddenly, I felt like so relieved. I had finally made some real progress in settling down here. What a difference a house makes in your life. Till about 10 days ago, I had been living and working out of a hotel room in Central Mumbai. 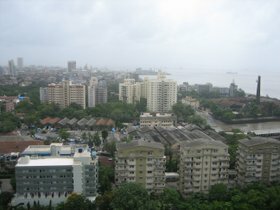 As soon as I arrived in Mumbai, I found myself facing the daunting task of closing three investment deals in parallel. There was little time for personal stuff, especially house-hunting (which tops my list of least favorite things to do). However, I did make some feeble attempts at house-hunting a couple of times but I didn’t find anything that I liked. After three months of living in a hotel room, I decided enough was enough. I took a week off from work and called a couple of real estate brokers. I told them I was going to close a rental deal in one week flat and needed to see as many properties as possible by Friday. My requirements: a 2 Bed Room apartment with a sea view, proximity to a park and within 20 minutes of Nariman Point (Mumbai’s downtown financial district). My budget: Rs 75,000-Rs 90,000 per month ($1600-$2000). The Mumbai broker is remarkably similar to his brethren in NYC. First, they showed me all the over-priced crap no one was willing to rent. By the time, we came to an agreement on what I really wanted, it was already mid-week. Then as luck would have it, the rain Gods woke up from their year long slumber. The skies opened up with a thunderous shower that that lasted two days and deluged the city in knee-deep floods. The weatherman said we were going to be flooded like this for the rest of the monsoon season. So I resigned myself to at least another month in the hotel. I was not a happy puppy that afternoon.